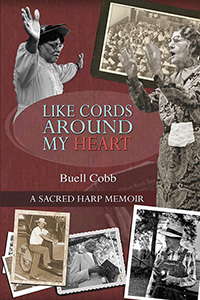 In the mid-1960s, Buell Cobb discovered and then immersed himself in one of America’s oldest and warmest community activities, the “driving, high-decibel, soul-in-the-throat” a cappella singing phenomenon known as Sacred Harp. Like Cords Around My Heart is a sharply observed account of many high points along the wandering personal journey that followed. If Sacred Harp once seemed a dying tradition in the Deep South, it now is experiencing a growth spurt across the entire U.S. and many other parts of the globe. This entertaining memoir, by a writer with a distinctive narrative voice, includes affectionate portraits of some of the key figures from the last half-century in this vibrant, now resurgent tradition. Buell Cobb is the author of The Sacred Harp: A Tradition and Its Music. A resident of Birmingham, Alabama, he has conducted Sacred Harp workshops across the U.S.